ADV-6000 - Professional Integrated Receiver/Decoder and IPTV Gateway | AdvancedDigital Inc. The ADV-6000 provides an ideal solution for receiving, re-multiplexing, descrambling and decoding broadcast signals. It is equipped with a variety of inputs that ensure compatibility with all transmission media. The ADV-6000’s re-multiplexing capabilities enable creation of new transport streams by combining existing sources. Customized services may be output as multiple SPTS or MPTS over IP, as well as over ASI. 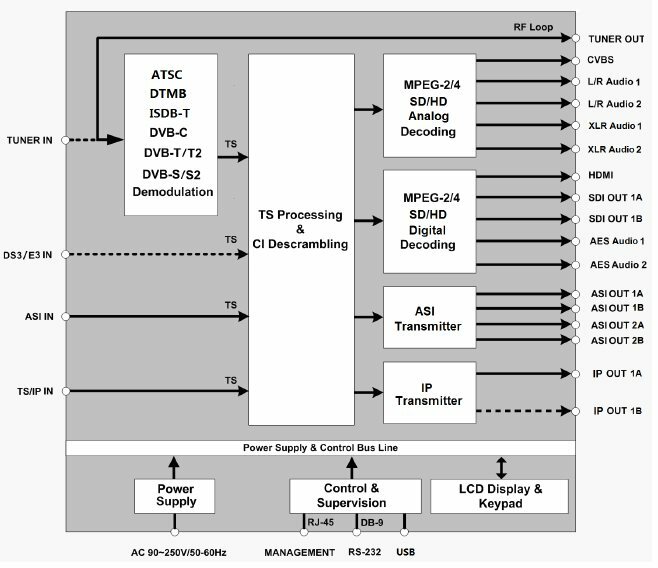 Through the dual DVB common interfaces, ADV-6000 has the capability to decrypt multiple services present in transport streams. ADV-6000 is also a professional IRD that features a broadcast quality decoder for MPEG-2 and MPEG-4 AVC/H.264, in both Standard Definition and High Definition formats, and provides a variety of industry standard digital and analog outputs, including CVBS video, AES/EBU Audio, analog Audio, embedded audio, HDMI, SD-SDI and HD-SDI. The unit can perform HD down-conversion and aspect ratio adaptation of HD programs in order to generate professional quality baseband analog video and audio outputs for easy integration with existing cable network infrastructure. This all-in-one architecture makes the ADV-6000 an ideal product for any broadcast environment.